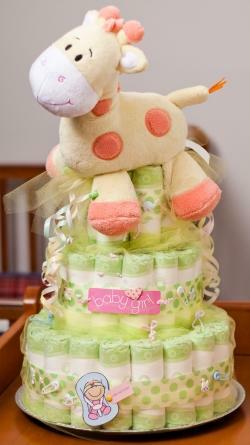 Diaper cakes are not only fantastic baby shower decorations, but they also make great baby shower gifts. The internet is littered with sites offering to sell you a pre-made diaper cake, but at those prices plus shipping who can afford it? Just like any gift, when it comes from your heart and hands it is that much more special. In this case it is more cost effective too. Don’t worry, cost effective isn’t code for cheap and second rate. You can make a diaper cake just as cute as anything you’ve seen and it really isn’t difficult. The first step is to decide what kind of cake you’d like to make. Do you want a simple short cake, or an ultra layer cake? No matter your fancy the first place to start is with a photo. You can use the one on the left as a guide or find one by shopping online for diaper cakes. Just pick a photo, follow these simple tips and your cake will be a hit! The basic supplies are: diapers, card board, large and small rubber bands and tape. 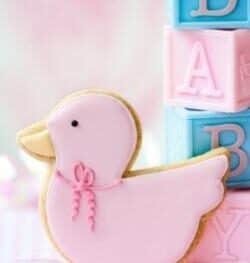 Additional supplies to decorate the cake and sent the cute quotient through the roof include: ribbons and bows in baby blue or pink, pacifiers, bottles, small stuffed toys or any other small baby supply item that is cute. The first thing you’ll need to decide when making the diaper cake is how large it is going to be and what size diapers you will be using. A three tier cake is cute and can use a different size diaper for each level, but you could also use the same size for all of it. If you are using different sized diaper for each layer you will need to purchase a large bag of each size. If you are using all the same sized diaper, then you’ll need three large bags or one super sized box (200+ count). Step one: Roll all the diapers like a burrito as tightly as you can. Use tape or rubber bands to keep them rolled. Step two: If you purchased the box of diapers you can use it, if not get another cardboard source. Cut three circles: the largest should be 18-20 inches in diameter, cut another circle 3 inches smaller, and a third circle three inches smaller than that. Step three: Arrange the rolled diapers on the largest cardboard circle starting at the center and working your way outward. To maintain stability use rubber bands at intervals. Once the edge of the cardboard circle is reached tie the diapers together with a ribbon. This is not only holds the cake together the ribbon is a pretty touch. Repeat this process with the other two layers. Step four: Stack the layers one on top of the other and decorate the diaper cake with the extras you have gathered. It is an especially nice tough to add a cake topper of some kind: a doll, stuffed bear or a framed photo from the ultrasound. Step five: Give your confection to the happy mother to be and enjoy the look on her face.